I bought this book from Audible and used the Audible iPhone app to listen to it. This is a great story from the creator of Discworld, Tiffany Aching, The Bromeliad Trilogy, Nation, and The Amazing Maurice. It is very different from those other stories, but it is full of his humor and voice. Stephen Briggs does a fantastic job bringing the characters to life. His acting gives each character great depth. The only Charles Dickens I have read was the minimum I could get away with in school as a kid, but after listening to Dodger I have a desire to give his works a closer look. I hope to read many more Terry Pratchett books like this one. Seventeen-year-old Dodger may be a street urchin, but he gleans a living from London’s sewers, and he knows a jewel when he sees one. He’s not about to let anything happen to the unknown girl – not even if her fate impacts some of the most powerful people in England. Beloved and best-selling author Sir Terry Pratchett combines high comedy with deep wisdom in this tale of an unexpected coming-of-age and one remarkable boy’s rise in a complex and fascinating world. 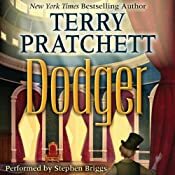 I rate Dodger a 9 out of 10, it is not a Discworld novel but it is a great read. I read this book out of sequence, I read Monster Hunter Legion before reading this one, but it wasn’t that big a deal. In Legion they mention what happens in Alpha but most of it is kept a secret from the rest of the team, there are a few things that did not make sense, but not enough to make it awkward. This story shows just how smart Larry Correia is, the first 2 books (and the 4th one) focused on the trials and tribulations of Owen Pitt, but the 3rd one focuses on Earl Harbinger for a change of pace and a chance to delve deeply into a different character. 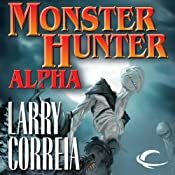 If he wants to, Larry Correia will be able to write Monster Hunter books forever changing the focus of each book at will. I am now really excited to read the book that ends the Owen and Julie line and begins a new focus for the series, if that ever happens. Dirty Harry meets Twilight. Number 3 in the break-out series and a follow-up to Monster Hunter International and Monster Hunter Vendetta. Earl Harbinger may be the leader of Monster Hunter International, but he’s also got a secret. Nearly a century ago, Earl was cursed to be a werewolf. When Earl receives word that one of his oldest foes, a legendarily vicious werewolf that worked for the KGB, has mysteriously appeared in the remote woods of Michigan, he decides to take care of some unfinished business. But another force is working to bring about the creation of a whole new species of werewolf. When darkness falls, the final hunt begins, and the only thing standing in their way is a handful of locals, a lot of firepower, and Earl Harbinger’s stubborn refusal to roll over and play dead. I rate this book a 9 out of 10, fast-reading pulpy fun. OK, I screwed up and listened to this one out of order, it is the fourth book in the series when I should have been reading the third, Monster Hunter Alpha. Luckily the third book focuses on Earl so much that reading them out of order didn’t mess up the story line for me too much. But when you read them, I highly recommend reading them in the correct order. Oliver Wyman continues to narrate the audio book and does so with great success. If you are the type that does not trust the government and believes that they would do anything to create bigger and better weapons, even human experimentation, then this book is for you. 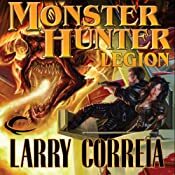 I am amazed at the amount of character development Larry Correia is able to slip in between the high-speed action of his stories. Owen and Julie’s relationship continues to grow and Mosh even gets to grow all while the action never pauses to take a breath. Great stuff. I rate this book an 8 out of 10, why aren’t you reading these already? They are great fun and quick reads. 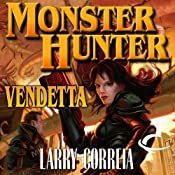 Oliver Wyman returns to narrate the second book in Larry Correia’s Monster Hunter Vendetta, book 2 in the Monster Hunter series of books. He continues doing a great job with all of the accents and odd speech patterns. The bad guys in this book take a huge jump up the scary scale. Owen and the other Monster Hunters of MHI are up for the challenge. I am really enjoying these books and am looking forward to more. Accountant turned professional monster hunter Owen Zastava Pitt managed to stop the nefarious Old Ones’ invasion plans last year, but as a result made an enemy out of one of the most powerful beings in the universe. Now an evil death cult known as the Church of the Temporary Mortal Condition wants to capture Owen in order to gain the favor of the great Old Ones. The Condition is led by a fanatical necromancer known as the Shadow Man. The government wants to capture the Shadow Man and has assigned the enigmatic Agent Franks to be Owen’s full-time bodyguard, which is a polite way of saying that Owen is monster bait. I rate this book an 8 out of 10, read the Monster Hunter International and then go right into this one.